GSIS PhD candidate Daehee Jang (advised by Brent Byunghoon Kang) has received the best cyber security paper award at the Cyber Conflict Exercise contest 2017 (CCE 2017). 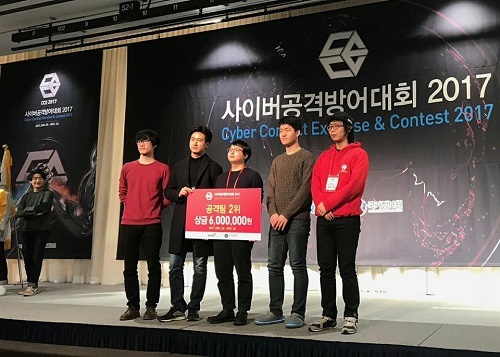 CCE is an event hosted by the Korea Institute of Information Security & Cryptography, the National Secuirty Research Institute, and the National Intelligence Service that holds both cyber-attack & defense contest and research paper public subscription. Daehee Jang’s paper (RUMA: Rethinking Byte Granularity Heap Randomization) was selected as the best among 117 research papers. Jang received \5 million. He also was the runner up on the cyber-attack & defense held on the same day. Jang’s paper researched about new vulnerabilities caused by memory layout randomization. “Winning the best paper and the runner-up place on the cyber defense completion would not have been possible without the help from My advisor Prof. Kang and my lab mates.” Said Jang. On top of that, GSIS Co-work research paper from Prof. Sooel Son, Prof. Yongdae Kim, Prof. Seungwon Shin and a research paper from Prof. Insik Shin also received excellence award from CCE 2017.